Local resident Pat Kavanagh has taken her love of color and decorating and turned it into a new business: Simply Grand. Using paint and glazes, Kavanagh does custom painting, including faux painting, wall art (trompe l'oeil, and motif painting), stenciling, and other decorative techniques on walls, as well as on other surfaces such as furniture. Kavanagh considers herself a self-taught decorative artist. She honed her skills while she was remodeling her own home on Lake Koronis. She also has gotten some painting pointers from local artist Ron Iverson. 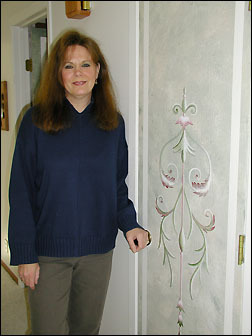 Pat Kavanagh got interested in custom painting while decorating her own home (including this motif on a door). Now she has started a new business to do custom painting: Simply Grand. Kavanagh and her husband began remodeling their home about a year ago. Kavanagh did the decorating herself, including glazing a faux finish on the walls, hand painting motifs over the windows, and finishing the fireplace with a technique that made it look like European stone. She decided that she enjoyed finishing her home so much that she should make it a career. She hopes to make it a full-time job. Besides decorative painting, she will do straight painting of interiors and hang wallpaper borders. She does not, however, hang wallpaper. Her husband, Wayne Chmelik, is a teacher in St. Cloud and will retire soon. Kavanagh believes he will become her business partner, making it possible for Simply Grand to offer other services such as exterior painting. Kavanagh, a former hairdresser, is an astrology buff and loves music. She relaxes by playing the guitar, spending time with her son, Casey, and working on a fish pond where she raises koi and water plants in the spring and summer.